Eritrea once again calling for the immediate and unconditional lifting of the unjust sanctions, as they are not based on fact or law and do not serve the interests of peace and justice. The United Nations Security Council imposed sanctions on Eritrea in 2009. Shortly thereafter, in 2011, sanctions on the country were expanded. These measures were, and remain, biased, unjustified, and not rooted in a genuine concern for international peace and security. No solid evidence was presented proving that Eritrea was guilty of perpetrating grave acts that threaten regional and international peace in contravention of, and as stipulated in, the Charter of the United Nations. The simple fact of the matter is that sanctions on Eritrea were imposed to shield the former Ethiopian regime’s noncompliance with the Eritrea – Ethiopia Border Commission (EEBC) demarcation decisions and deflect from its occupation of sovereign Eritrean territory, as well as to unjustifiably punish Eritrea for its refusal to get derailed from the legal border ruling and its candid opposition to previous US Administrations’ misguided policies in the Horn of Africa. In fact, the sanctions were conceived and planned long before the existence of the pretexts for them, as revealed by leaked cables released by WikiLeaks. At this stage, the continued imposition of sanctions against Eritrea can only be characterized as the continuation of a severe miscarriage of justice, politically-motivated, and not rooted in a genuine concern for regional or international peace and security. Currently, as the winds of peace blow throughout the Horn of Africa, Eritrea’s numerous cooperation and friendship agreements and frameworks with countries across the region starkly reveal that any suggestions the country is a threat to peace and security are highly tenuous and extremely flimsy. Furthermore, the attempt to establish a new set of preconditions, particularly in relation to Eritrea’s alleged internal conditions or policies, is a blatant case of “changing the goalposts” in order to justify the unfounded measures taken by the Security Council against the country. Regarding the issue of Djibouti, Eritrea long maintained that there was no “good-faith border dispute” between the two sisterly nations, and if it existed the mechanisms that both the governments put in place in the years prior to the incident could have led to an acceptable bilateral solution, without internationalizing the matter. In reality, the issue was part of a ploy to tarnish Eritrea’s image and encircle it regionally, with the intent of diverting attention from the mounting pressure on the then Ethiopia regime to respect the demarcation decision of the EEBC. Unjustifiably, Eritrea was first condemned by the Security Council for “aggression” against Djibouti and days later the Council requested to dispatch a fact-finding mission to the region to investigate the incident between the two countries. The question, however, still remains, on what basis did the Council first condemn Eritrea if it did not have all the facts in the first place? Furthermore, why was it necessary to elevate a putative dispute to that level and use it as a basis for sanctions against Eritrea, particularly when the Security Council had kept silent for years in regard to Ethiopia’s occupation of sovereign Eritrean territories? 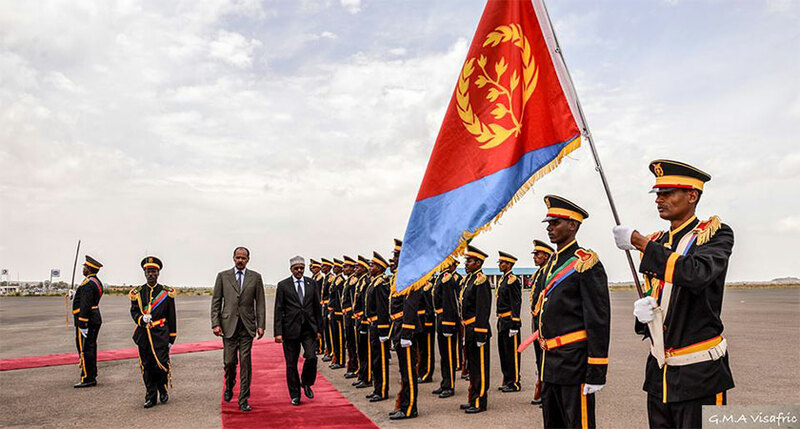 In any regard, these are irrelevant points within the context of Eritrea and Djibouti’s recent normalization of relations and establishment of a new chapter of cooperation and friendship. It cannot be overlooked that beyond being unwarranted and unjustified, the sanctions imposed on Eritrea effectively have restricted it in defending itself – a fundamental international right enshrined under the Charter of the United Nations – against the former Ethiopian regime’s military occupation and unrelenting aggression or terror-related threats which abound throughout the region. Additionally, in stark contrast to the claims of some, the sanctions have, indeed, had an undisputable, direct, significant, and harmful impact upon the people of Eritrea through severely diminishing possibilities for international cooperation or beneficial partnerships, considerably raising the cost of capital in commercial loans, having negative implications for foreign investment, reducing possibilities for job creation and economic growth, and restricting the import of certain categories of equipment vital for development and social infrastructure. Eritrea vehemently calls for the immediate and unconditional lifting of the unjust sanctions, as they are not based on fact or law and do not serve the interests of peace and justice. Rather than being the transgressor or perpetrator, Eritrea has been and remains the aggrieved party. By removing the unlawful sanctions, not only will the Security Council take an important step to rectify a severe miscarriage of justice and restore eroded credibility, it will help contribute to much-needed peace, security, and stability in the Horn of Africa and show genuine support for the rapid, momentous changes currently unfolding across the region.